One of the highlights of my trip to Wisconsin was playing in the largest game of Werewolves of Millers Hollow I've ever played. We ended up having nineteen people in one game. 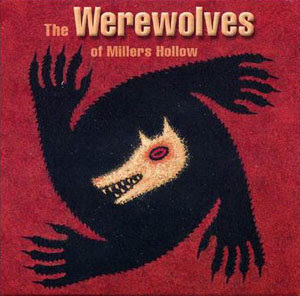 Werewolves of Millers Hollow is the greatest party game ever. It is the hands down favorite amongst our friends. If you've ever played Mafia, it's the same game only with werewolves (thus better). The group is divided into Townspeople and Werewolves. The Werewolves kill one townsperson each night. The next morning the Townspeople debate and eventually execute one Townsperson they suspect of being a werewolf. The game becomes a race for the town to find all of the werewolves before the wolves murder everyone in the town. This version is our personal favorite but you can also find versions called "Are You a Werewolf?" and "Lupus in Tabula." I highly recommend it if you ever have minimum of eight people at your house. Sounds a lot like Bang! which is a lot of fun. Bang! sounds like it's basically the spaghetti western version of Werewolf. Not having Bang! though, I think I'll order this. Auuuuuuuuuuuuu!!!! !Looks interesting, I Play in Mafia! But this game, we don't have in sale!!! 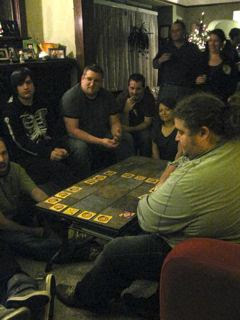 Anytime I'm in a large group of people, I ALWAYS do my best to force us to play a game of Werewolves. Definitely the best party game ever. There's an awesome iPhone app that does most of the 'Moderator' work for you, too. I think it's 99 cents, too. I love Mafia, but having werewolves instead of gangsters does sound way cooler. Thanks for introducing it to us! We played Murder In The Dark as kids- essentially the same game. We'd play with 3 or 4 and just keep starting over every 2 minutes. This game sounds so much fun! I love mafia and you are right werewolves makes it way better. Never heard of it but we like to play games so I'm going to keep my eye open for it. Have you ever played Mexican Train Dominoes or Wizard? Mexican Train Dominoes is like your standard dominoes game where you have to match up numbers but it's sort of got a twist in that you can play off other people's "trains" and mess them up. Quite a bit of strategy. Wizard is a card game sort of a mix between Hearts and Bridge but it uses a special deck with four cards known at Wizards which trump everything and 4 jesters which will guarantee you lose a trick when you play it. You have to pass three cards to a neighbour and then make a bid on how many trick you'll win. Win the right amount and you make points, get fewer or more than you bid and you lose points. Oh man! I love that game. I am, however, the worst guesser ever. if there are 8 people in my house 7 of them better be pall bearers. I love that game, I've never played werewolf, but I have played mafia. Do you play with detectives? I like being part of the mafia or werewolves. We played Are You a Werewolf with a group of 12 people that included a barely-reading 5-year-old. It was a blast; we played it for hours! I'll have to check out the version you played. I still can't figure out how this 12-year-old kid always knew--I was Moderator a couple of times and he wasn't cheating! He should probably work for the CIA or something when he grows up. @Topanga--we played Mexican Train Dominoes last New Years Day with another set of friends. It's pretty addictive but in a different way. As long as we're talking games here, one I saw this summer and really want to try is Who Would Win? It's a card game where two teams draw two cards with people or "creatures" on them, real or fictional, and then the moderator draws a third card and they have to argue who would win. It could be Darth Vader Vs. Hilary Clinton at white water rafting. Or Donald Trump vs. Batman at flower arranging. And then people have to vote who has the best argument! Dude. I LOVE this game. It's so much fun because you can be insanely creative with the narration. And you get to kill all your friends. We have Lupus in Tabula and it's a blast! What is the difference between that and your version? I'll have to see if I can track it down online and then round up at least 12 friends! Have you ever played Settlers of Catan? That is more of a 4-6 person game, but I could see you really enjoying it. Were you a werewolf or a townsperson, or both? I played Werewolf for the first time at our family reunion this summer. It was sooo much fun! Lupus in TAbula isn't quite as good as Werewolves of Miller Hollow. The difference lies in how you vote for werewolves during the day. In "Lupus", you nominate people, and then vote yea or Nay on them, in "Miller" it's more chaotic with the moderator announcing the vote at a random time. I like the Miller version because it gives a feel of a hysterical village lynch mob taking out the Werewolves. For more info about all board games, go to www.boardgamegeek.com. It's a huge gaming database that you'll be sucked into, and waste a million hours of your time at if you enjoy gaming. Hope that answers some Questions. It's great to know that celebrities love gaming too. DO you know there is an expansion set? Pretty funny, you have to pick sort of a chance card each day, and on it it says something like: everyone who uses the word " I" or "Wolf" during the debate cannot cast a vote. DudE!! That sounds sooo fun!!! Thanks for the post! DudE!!! That sounds so fun! Thanks for the post... me and the family will be trying this out on your suggestion. But it definitely works best with parties of around 7 to 14 people. It includes a special deck of roles called "The Purge Deck", which you draw from when you get eliminated... thus, you are never eliminated from the game and can keep playing. That site has the rules, and a link to get the cards. I am a member of several Mafia forums. It is quite addicting and takes around a month to complete a single game. Each game has a different theme: Lost, The Simpsons, Buffy, Werewolves...just to name a few. Oddly, I have never played in real life, though. I just stumbled on your blog....and yes, that game is the.best.group.party.game.EVER. I guess you play it all over the world because I am german but I have also played it in the Netherlands. We mostly do the mafia version, though. Last year, my friend had a mafia - themed birthday party. We usually play with tons of extra roles and s there were many epic costumes - I was Cupid. Fun times. Another FANTASTIC party game is Quelf. You gotta try it! The first time I played I was sore the next day from laughing so hard! I highly recommend it! Werewolf is the best game ever!!! It's a good game for camping.